(l-r) Knights of Columbus St. Anthony Council 1585 (Wood-Ridge, NJ) Peter Gallo, Ed Sullivan, Bill O'Shea (Bill O'Shea's Florist), Thelma Fedele (Center for Food Action Director of Emergency Services), Knights of Columbus Msgr. Fitzpatrick Council 7041 (Hasbrouck Heights, NJ) Anthony V. Miele (PGK), Martin P. Saccomano (Secretary), and Francis Miele. The Center for Food Action received a check for $3,400 during a brief ceremony at Bill O'Shea's Florist at the Circle in Hasbrouck Heights on April 18, 2001. This donation was the result of hundreds of bright red ribbons decorating the Boulevard in Hasbrouck Heights and Wood-Ridge during this recent holiday season. Area residents donated $10 to the Center For Food Action. Bill O'Shea's Florist provided a beautiful red ribbon with the contributor's name on it. Generous contributors, who donated $50 for a special breakfast and a traditional Christmas or Hanukkah dinner for a family in our neighborhood, received embellished ribbons. In additon, the Feinstein Challenge grant provides a percentage match of this $3,400 donation. 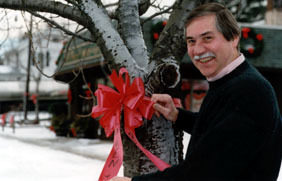 The ribbons were placed on every tree and telephone pole along the Boulevard in Hasbrouck Heights (from Route 46 to Wood-Ridge), by Knights of Columbus Msgr. Fitzpatrick Council 7041, and in Wood-Ridge by (from Hasbrouck Heights to Carlstadt), by Knights of Columbus St. Anthony Council 11585. The ribbons were removed after Valentine's Day. The Center For Food Action is a non-profit food center that has served our area's needy since 1976. The ribbon was provided by Harvey Jaffe of Designer Dispatch Ribbons and Floral Accessories.